Apple has officially pushed out iOS 11.4 beta 2 to public testers. Tim Cook’s company took the opportunity yesterday to seed iOS 11.4 beta 2 to the development community and has now extended that testing pool for iOS 11.4’s second pre-release seed by including all individuals who have registered themselves with the Apple Beta Software Program. The fact that iOS 11.4 actually exists at all is a testament to just how serious Apple is about progressing its iOS platform and getting the best experience for iPhone and iPad owners. This particular beta release follows very closely in the footsteps of the public release of iOS 11.3, which was a fairly notable release for the fact that it introduced a whole host of new functionality and significantly improved the iOS proposition thanks to the inclusion of Business Chat, ARKit 1.5, a battery health section, and brand new Animoji characters. iOS 11.4 is a slightly smaller update but it definitely is a continuation of that great work. iOS 11.4 also reintroduces the elusive Messages on iCloud functionality which has made an appearance in previous version of iOS and macOS only to be inexplicably removed without warning. Hopefully, that functionality is here to stay this time around. If this remains present when it comes to launching time, then users will have the ability to opt to store iMessage conversations in Apple’s iCloud platform and have them pushed out across multiple devices. iOS 11.4 also brings Apple TV back to the Home app thanks to the reintroduction of support for AirPlay 2 and the features that it provides. Taking the covers off AirPlay 2 will mean that the same audio can be played in multiple rooms throughout the home. Perhaps not the most important feature, but Apple has also added a brand new (PRODUCT)RED wallpaper unique to iPhone 8 and iPhone 8 Plus, which will actually bring a smile to a lot of faces as it will be designed to perfectly complement the stunning design of Apple’s latest iPhone. 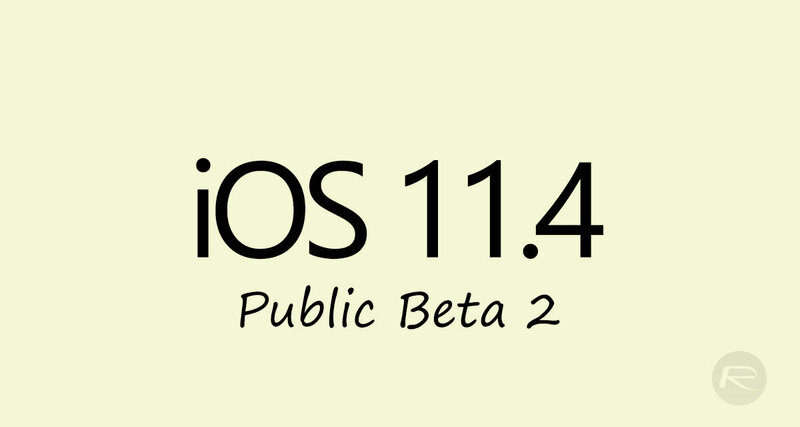 If you are a public tester who wants to get to grips with everything that iOS 11.4 beta 2 offers, then you can grab the download on your device right now from Settings > General > Software Update section of your iOS device provided you already have configuration profile installed for iOS betas. If this is the first time you are installing a public beta, head over beta.apple.com to get started with Apple Beta Software Program. Update: Alongside iOS 11.4 public beta 2, Apple has also released public beta 2 of tvOS 11.4 and developer beta 2 of macOS 10.13.5.